Isabelle Huppert and Time of the Wolf filmmaker Michael Haneke reteam for a drama about a middle-class French family with an emotional sickness at its heart. The previous film from Austrian filmmaker Michael Haneke was 2012’s Amour, a moving story of late-life suffering underscored by love. His latest, Happy End (don’t believe that title for a second), feels like a kick in the teeth of that film, as though someone had accused Euro-cinema’s high-minded provocateur of going soft and he responded by reprising the suffering of Amour but cancelling the warmth completely. Bleak in atmosphere and teasing in its jigsaw construction of ensemble moments, Happy End is a snapshot of roughly a year in the life of the Laurents. They run a major construction firm and live in old-money style with live-in servants. But there’s nothing familial about them. They share the same DNA but mask their depressions, schemes and perversions from each other. (Actually, maybe that's very familial.) Haneke reminds us, too, that just down the road from the Laurents is a migrant camp: If we’re to read anything into the diseased privilege on display, we should assume Haneke is talking about much more than just one family. This is a state-of-modern-Europe morality play. At the head of the household is ailing Georges (Jean-Louis Trintignant), who doesn't have a friendly word to say to anyone and is consumed with anger and regret. His daughter, Anne (Isabelle Huppert), runs the family business day-to-day and has a grown-up son, Pierre (Franz Rogowski), who has a drink problem and a chip on his shoulder about the family’s wealth. Anne’s brother, Thomas (Mathieu Kassovitz), is an emotionally-stunted doctor, married to his second wife, Anaïs (Laura Verlinden), but seeking dirty thrills online. He has a new baby but must remember that he’s already a father when 13-year-old Eve (Fantine Harduin) comes to stay after his ex-wife attempts suicide. 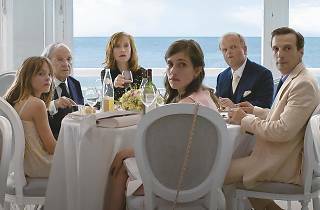 Happy End harkens back to almost all of 75-year-old Haneke’s previous films, so much so that it feels like a career epilogue. Just as in the director’s first feature, 1988’s The Seventh Continent, suicide hangs heavily over Happy End. And admirers of his other movies will see echoes everywhere: a tracking shot similar to one in Code Unknown; film-within-a-film surveillance cameras and home videos as in Caché (Hidden) and Benny’s Video; even a creepy young man with dark shadows under his eyes who looks like he’s stepped out of either version of Funny Games. 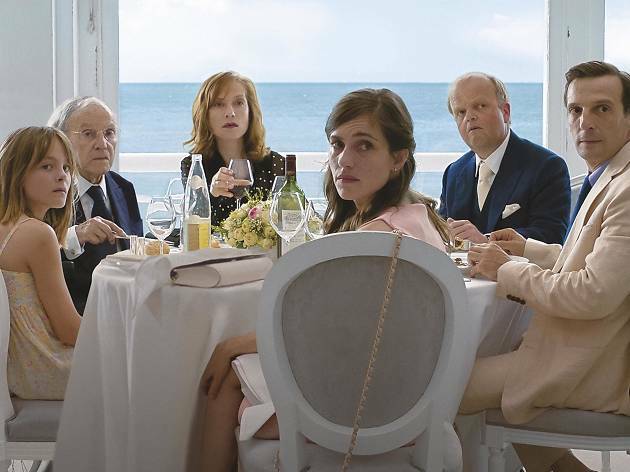 There are hints that this is a companion piece to Amour, partly in a plot point that mirrors exactly an event in the earlier film, but also the casting of Trintignant and Huppert as father and daughter, and again giving Huppert’s character a British partner, although this time he’s a London financier played by Toby Jones. Happy End is more meandering and less contained, though, and it doesn’t have a central, gripping mystery like The White Ribbon to make you lean in more than you recoil. Rather, it’s a more diffuse film, and a more despairing one, although there are flashes of gallows humor to lighten the pileup of downers. As for the happy end? Happy hunting.